*Disclaimer: I received this wine as a sample from the PR folks for Tapeña Wines. The whites flow like water in our house. It is close to 100 degrees here every day and the humidity. Oh the humidity. The weather cries out for tart white wines or a cold cold beer. Something I have also been enjoying quite a few of this year. But this isn’t a beer blog. Though it could be with the number of IPAs I’ve tried in the last 7ish months! The wine. 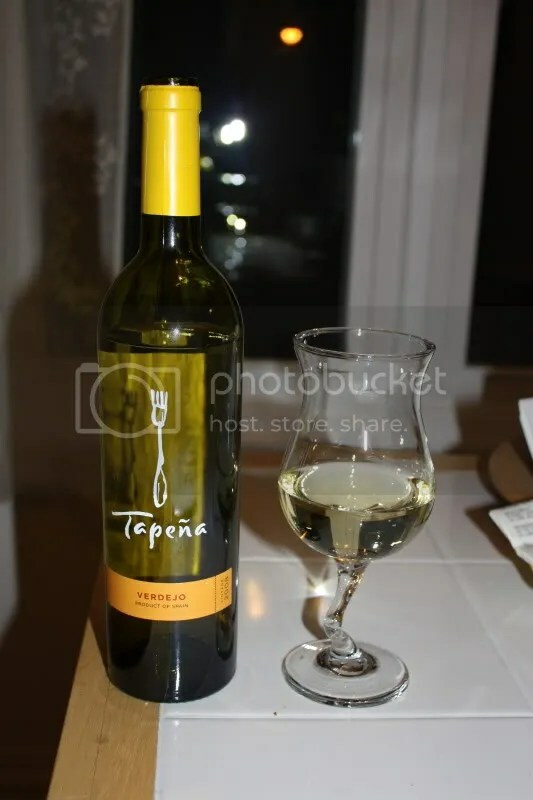 On this hot night we opened the 2008 Tapeña Verdejo. The Verdejo clocked in at 12.5% alcohol by volume, had a real cork closure, and retails for $7-$8. 1.) A bottle of Yellowtail will run you $6-$9. This wine is, at most, a dollar more expensive. And a million times better for your money and much much more interesting. 2.) Drink a bottle with chicken. Or your favorite white fish on the grill. 3.) If it’s swelteringly hot at your house too and you are looking for something different to drink this fits the bill. 4.) You can have a party, buy enough of this wine for everyone, and not break the bank. On the nose I got flowers, lime, lemon, peach, light green apple, and tropical notes. In the mouth I found tart lime, lemon, grapefruit, and peach. The citrus showed prominently on the palate. Overall I found the wine to be tart, refreshing, and fruity. 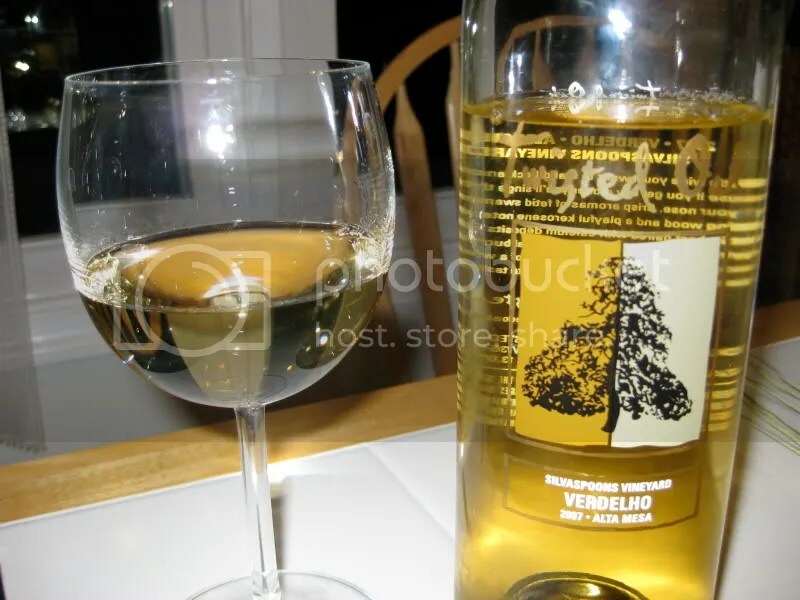 Affectionately referred to as the ‘ho, I’m really talking about the 2007 Twisted Oak Verdelho. I love this wine…everything about it…the price, what’s in the bottle, yum! I’ve reviewed the 2006 and the 2005 in previous years. This latest bottle arrived in my Twisted Few Club shipment and retails for $16, but at the club price it’s $12.80, making it a supreme bargain and a great wine for the hot days ahead. The ‘ho has a screw cap closure and clocks in at 13% alcohol by volume. On the nose I get pineapple, tropical fruit, spice, peach, mandarin oranges, banana, and papaya. In the mouth I found the wine to have a a slightly creamy texture and I got flavors of lemon, tropical fruit, papaya, melon, pear, citrus, and granny smith apples. 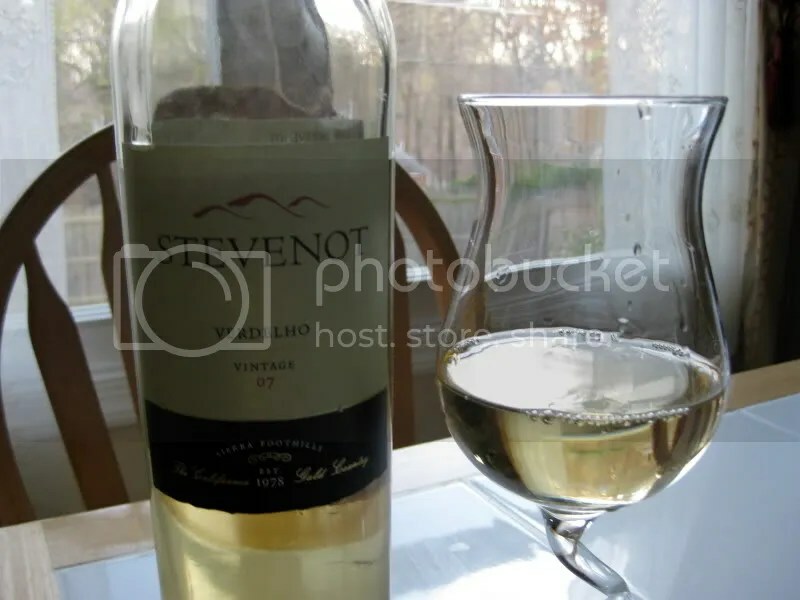 Overall, the wine is dry, crisp, and easy to drink. A definite must buy for the summer months! Spring is in the air, I swear! My Daffodils have actually already bloomed and faded, as have my Hyacinths. I’m only waiting on my Peonies and Irises and then my garden will be done for the Spring. However, the weather doesn’t seem to agree with me as it’s mid-April and only 42 degrees out….thankfully we are headed for warmer parts in Sonoma and Napa this week! Last night I chose the 2007 Stevenot Verdelho from Calaveras County. I picked this up last fall on my swing through Murphys. It retails for $15, though I paid something less than that with a discount, had a plastic cork, and clocked in at 14.6% alcohol by volume. On the nose I found flowers, honey, honeysuckle, orange blossom, citrus, peach, lemon, and some tropical notes. The aromas on this wine just poured out of the glass. In the mouth I got flavors of peach, orange, lots of lemon, a little honey, slight spice, and apricot. 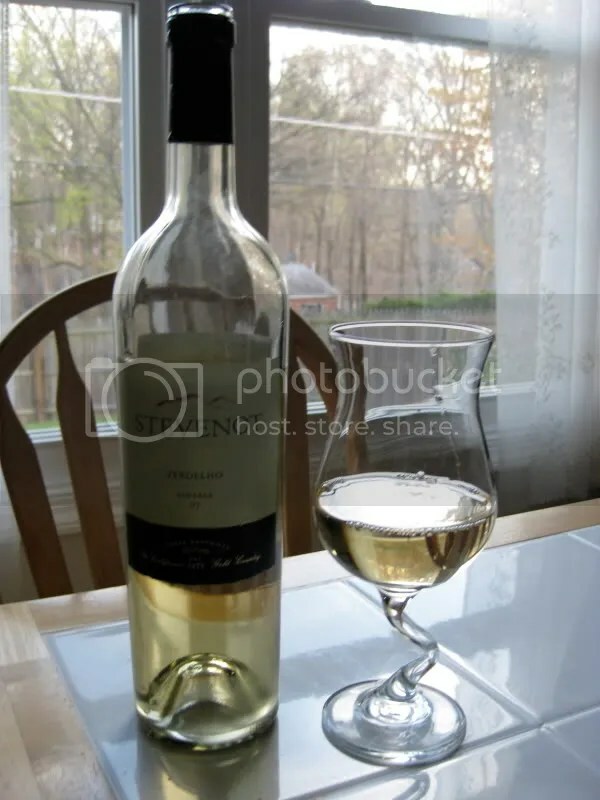 This wine would be perfect to enjoy on the porch with the hot weather I know will get here eventually! Sorry for the silence around here! I had no way to hook my computer up to the internet since Wednesday and am just getting back online today! We should be back to your regularly scheduled wine programming from here on out, no vacations for the Wannabe Winos for quite some time! I have lots to report on from our Sonoma trip, great new wineries, restaurants, more wine….! All in all, an excellent time was had by all and I really enjoyed getting to meet some of the wine bloggers I’ve been chatting with for a couple of years now! More on that later. As for the wine of the night, it was a 2006 Twisted Oak Verdelho from Alta Mesa Silvaspoons Vineyards. The wine arrived in my very first Twisted Oak club shipment, along with Bob my chicken 🙂 It can be purchased from Twisted Oak from $16, clocked in at 13.4% alcohol by volume, and had a screw cap closure. On the nose I found cream, white pepper, tropical fruit, cantaloupe, peach, and flowers. The wine was very aromatic. I also loved the pale straw color of the wine. In the mouth the wine showed pineapple, peach, citrus, and melons. The wine was surprisingly crisp and very refreshing. We quaffed it on an unusually warm winter evening in the DC area, on its own, and it was perfect. I’ve previously reviewed the 2005 version of this wine, which you can read here. *Disclaimer: I received this bottle from WineQ because I am a member of their Beta Club. This bottle of 2005 Barreto Cellars Verdelho came several shipments ago from WineQ and I have been very delinquent in reviewing it. It hails from the Lodi appellation on the Central Coast of California. It had a real cork closure, clocks in at 14.7% alcohol by volume, and can be purchased from WineQ for $14.99. On the nose I found citrus, tropical fruits, honeysuckle, and minerals. The nose was quite aromatic, you didn’t have to get too close to your glass to smell this one (hence, I didn’t end up with a nose full of wine this time!). In the mouth there were flavors of grapefruit, other citrus, peach, and tropical notes. Overall the wine was tangy, very very crisp, acidic and a bit different than anything else I’ve had. I believe this is only my second Verdelho, so I’m still not sure quite what to expect from them, but I really like them. I think this would be a great choice for appetizers at all those upcoming holiday parties as the grapefruit flavors are quite strong and palate cleansing and would do well up against creamy dips and cheeses. 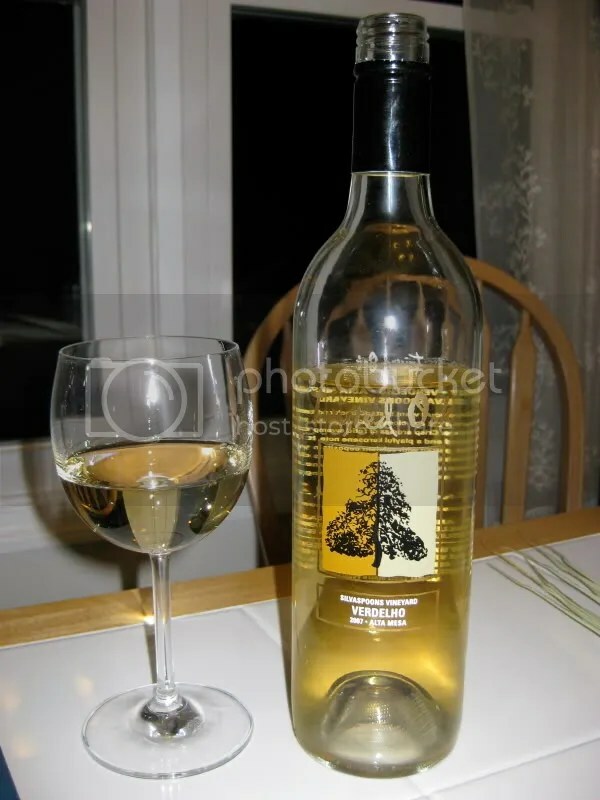 This bottle of Twisted Oak 2005 Verdelho arrived in my very first shipment from WineQ. I have been meaning to try the wines from Twisted Oak for quite some time now, but let’s face it, I’m a bit lazy and I can be forgetful (yet another reason WineQ works really well for me, I don’t have to think much about it beyond adding more wines to my queue, minimal effort is excellent) so I hadn’t gotten around to it. But now I have and I can say for certain this will not be our last bottle of this one or from Twisted Oak in general….I have my eye on the Petite Sirah…. Anywho, onto the wine. Screw-cap (which actually came off the bottle without Matt having to take the pliers or a knife to it, thanks Twisted Oak! ), 13.2% alcohol by volume and cost $15.99 (free shipping!). The nose of the Verdelho was very aromatic. It started out with a strong sense of pineapple giving away to apple. Flowers then dominated the nose. In the mouth there were pears, apples and peaches. The wine had excellent acidity and structure. I served it with parmesean breadcrumb baked tilapia and leftover risotto. Some kind of vegetable too, though my memory is foggy and I couldn’t take a picture of the dinner with the wine as you couldn’t see the bottle up against my pile ‘o junk. The light flower and crisp fruit flavors in the wine paired well with the light flaky fish and the acidity did well up against the creamy cheese risotto. Overall, we loved this wine. The flavors and aromas were great for the summery weather we’ve been experiencing here and the value was excellent.